DAN-JOE & MALCOLM (WW1) - Chapter 10, "The Canadians At Courcelette"
Ch. 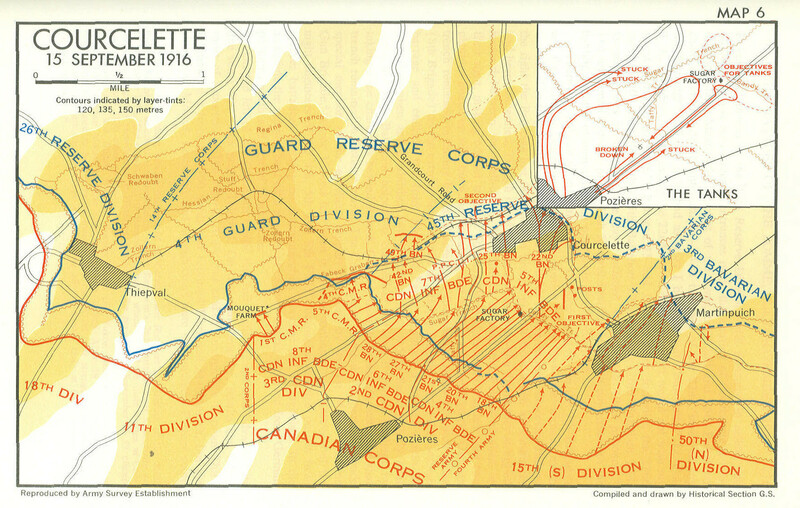 10 - "The Canadians At Courcelette"
"On September 15th, in conjunction with the operations of the Fourth and French Armies, the Canadian Corps is attacking the German positions. The 2nd Canadian Division [which included the 26th Bn.] will capture and consolidate the German trench line from [several map coordinates were set forth] ... and will establish Posts generally along the front line in advance of the objective. ... The 5th Canadian Infantry Brigade (less the 24th Battalion) will be in Divisional Reserve ... At Zero hour [6:00 A.M.] ... the Infantry will advance and the intense shrapnel barrage will begin. [Timing is set forth, so that the barrage will be lifted just before the infantry will be at their objective, that is to say, Zero Hour plus 43 minutes.] The Barrage will lift at the rate of 50 yards per minute [One of the objectives set forth is "the North and east sides of Courcelette." When the barrage is lifted] the 6th Canadian Infantry Brigade will send forward three patrols each consisting of one officer, 30 men and Lewis Guns, into Courcelette, with the object of establishing three posts in the S.W. corner of the village on the general line ... The rate of advance is calculated at 100 yards in 3 minutes. ... Each man is to be provided with 2 bombs and 3 sandbags, in addition to regulation Fighting Equipment ... 2 days' rations in addition to the Iron Ration41, S.O.S. Rockets - 24 Red and 12 Blue. ... Battalion Dumps will be established ... 250 picks and 250 shovels. ... No. 7 Squadron R.F.C. [will] ... fly over the objective as soon after Zero Hour as the light permits [the planes will be marked, with streamers, etc.] ... Prisoners will be sent back to Brigade Headquarters ... All troops before going into the trenches on night Sept, 14th/15th will be provided with a hot meal, which should be issued as late as possible. Watches will be synchronised [A further note sets out that runners will be established between each unit and] "Advanced Brigade Headquarters ... from Zero hour onwards. ... the 5th Brigade advances and will cover our right flank. ... The 22nd, 25th and 26th Battalions will take the village and the 24th Battalion will be in Brigade Reserve. ..." The 22nd and the 25th will lead the attack and "the 26th Battalion will immediately follow the attacking Battalions and will act as a mopping up party and will clear the village. The division line between the 22nd and the 25th Battalions will be the main street ... running through the village square. ... Contact Aeroplane will go over the line at 7:00 P.M. and 7:30 P.M. and flares will be shown by advanced posts and front lines only. From what we can see of it, our heroes were in the thick of it at the Village of Courcelette, through the middle of which the German line ran. The troops moved from shell hole to shell hole through the ruined village, along the "sunken Road from the cemetery to the Baupause Road." They suffered "heavily from the barrage thrown by the Germans along our line ... This attack met with considerable opposition and rifle and machine gun fire was very heavy." The reporting officer then listed the officers (men do not get the same treatment): 3 by "rifle bullets"; five others wounded. "Throughout the entire day the shelling continued very heavy." An analysis of the dead and wounded, discloses that a large number of causalities occurred during these 3 days, the 15th through to the 17th. In the Battle for Courcelette three Canadian battalions were involved. Just for the 26th Battalion there were 5 officers and 59 men, killed; same dates, 6 officers and 148 men wounded. Our heroes, Dan-Joe and Malcolm were in the thick of it and got through it all in one piece. On the 26th of September, Dan-Joe and Malcolm's battalion (the 26th) was at Brickfields and had been there since having been relieved on the 18th from the fighting at Courcelette. There were large losses at Courcelette, but the eight days of being behind the line recovered them to a degree, and they had regrouped. They were then told to move to Courcelette, once again. They struggled up through the night of 27th-28th. Courcelette had been pretty much secured due the efforts back on September 15th to 18th, but there was still a German presence to the north-east of the village where there was a trench known as "Regina Trench." The battalion was ordered to take it. Scouts, before the advance was made, reported the trench was empty of enemy soldiers; so it looked like the battalion should have an easier time of it than they did days earlier when they took Courcelette. However, the scouts, as was determined later, got confused and looked in the wrong trench. The Regina Trench was well manned by Germans. And so, we have painted out the scene leading up to a great trauma that overtook the Morrison family. Because of our advancing patrols and as the trench was thought to be unoccupied, it had not been shelled and any concerted movement above ground, especially in the clear atmosphere which then prevailed, was met with heavy rifle and machine gun fire. These companies were pinned down in this exposed area for the rest of the day. Here are a few accounts of the Battle of the Somme from the soldier's perspective. First from a machine gunner, George Coppard, as set out in his book. This is how he described what he saw in respect to an earlier battle in July. "Nothing happened at first. We advanced at a slow double. I noticed that it had begun to rain. Then the enemy machine-gunning started, first one gun, then many. They traversed, and every now and then there came the swish of bullets. It's a bloody death trap, someone said. I told him to shut up. But was he right? We struggled on through the mud and the rain and the shelling. Then came a terrific crack above my head, a jolt in my left shoulder, and at the same time I was watching in an amazed, detached sort of way my right forearm twist upwards of its own volition and then hang limp. I realised that I had been hit.